Harmony is set to Basic Palette Lists mode by default. 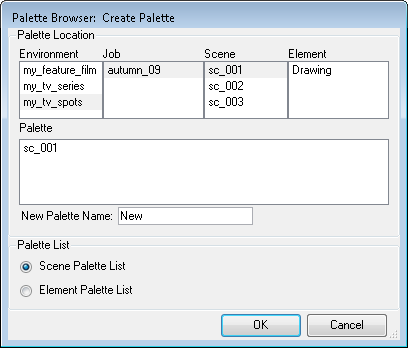 This setting stores the palettes automatically for you and saves them at the Scene level. When you use Advanced Palette Lists mode, you can decide at which level you want to store your palettes; Environment, Job, Scene, Element. ‣ The [Ctrl] + [U] (Windows/Linux) or [⌘] + [U] (Mac OS X). 3. Enable the Advance Palette Lists mode. 4. In the Colour view, click on the Menu button and select Palettes > New or click on the Create Palette button. The Palette Browser: Create Palette dialog box opens. 5. Select which level to store the palette file in. When you select a level that has a palette stored in it, the palette names are displayed in the Palette field. The new palette appears in the palette list.